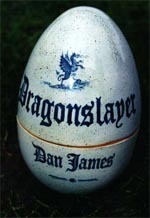 Dragonslayer became armchair hunt number five, and was written, created and devised by founder Dan James. It featured in the November 1994 edition of the newsletter. The story of a King and his exploits with a dragon who would repeatedly pinch all of the royal treasures. The hero of the story, the Alchemists Apprentice, hatches a plan to rid the land of the dragon and claim the hand of the King's Daughter. The clues led to the egg shaped casket above, which had a scroll of ownership inside. This scroll would entitle the finder to the treasure, a hand decorated egg in the style of the famous Fabergé eggs. 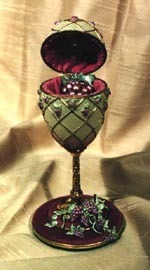 It was adorned with tiny bunches of grapes throughout, and inside there is a larger bunch of grapes, three of which are made of eighteen carat gold. The hunt ran until September 1996 having been discovered by member Jeff Crane in Herefordshire. Two buried red herrings for this hunt were also discovered by Brian Souter from locations in Nottinghamshire and Reading.